Oshiomhole spoke to State House correspondents after having a closed door meeting with President Muhammadu Buhari on Wednesday in Abuja. 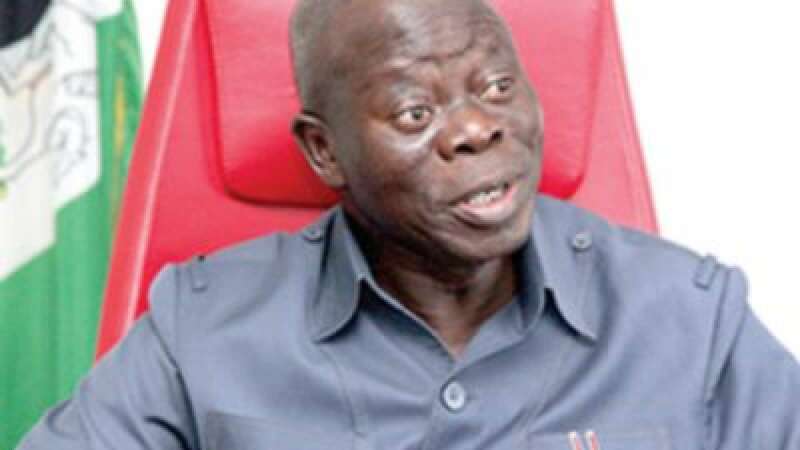 Adams Oshiomhole, National Chairman of the All Progressives Congress(APC), says he will not mortgage his conscience in order to keep his job. Speaking on the fallout of APC primaries, he dismissed rumours that some governors were moblising to unseat him. According to him, he knows that the job is not a pensionable job as he will leave it one day; hence he will do the job according to the rules and his conscience. He said that out of the 23 APC governors, only three were not pleased with the outcome of the primaries in their states. Oshiomhole said that no one could begrudge the governors for not being happy if a particular outcome did not coincide with their expectations. He said that he neither had the power to appoint nor the power to change anything particularly when things had been properly done. According to him, the three governors who are unhappy are his friends. “So, all I have tried is to find some courage to enforce the rules and I think an overwhelming majority of the governors appreciate that I have done the best because change is not easy. “We all want change but the process of change can be quite traumatising; because it is not painless. People have been used to a particular way of doing things; to encourage them to do them differently can be a challenge. “So, here I am as national chairman conducting primaries, the outcome of which some very powerful people did not see their preferred candidates emerging. “Let me say that if there is a choice between my conscience–what I believe is right and mortgaging that conscience in order to keep the job, I will have no difficulty resolving it in favour of my conscience. The APC national chairman said however, that the issues would be resolved as internal family issues as the three governors were his friends. He said that in a moment of distress, he believed that the friendship was enough to help them to build reconciliation. According to Oshiomhole, he respects and appreciates the governors for the fact that but for their support, he would not become APC chairman. “And you do not go stepping on toes of those who helped you to get into position. “But however, I thought I was clear and I remain clear that helping me to get to the position, it was to help APC to return to its core values of progressive politics, of fairness, of justice, of adherence to rule of law and total submission to the extant provisions of our party constitution. “In doing that, you do not look at power; you look at what is; what is just. “I think that with time, we will reconcile all these; Amosun is my good friend; we have known each other for a very long time; we exchange personal visits in addition to official visits; Zamfara governor has been the Chairman of NGF and I was an active member of that forum; we have wonderful time together and I believe in the future, we are still going to have wonderful time together. “Governor Rocha’s Okorocha was one of those who had issues with my predecessor and I did my best to try and resolve those issues in a way that has been given him a new platform. “And I am happy that God used us to do that not by cheating in his favour but by doing what is right; it is just that once you stick to the goal, sometimes, you either get caught on the right side or the wrong side,’’ he said. He said that some Abuja-based politicians were not known in their villages and they thought they were popular; but when their `loudness’ in Abuja failed to translate into electoral victory; they looked for who to blame.